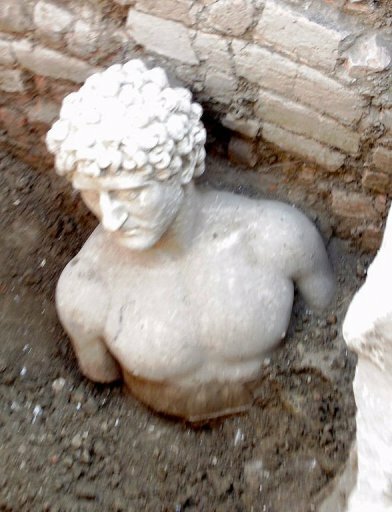 Archaeologists excavating the ancient city of Apollonia in what is today Albania have uncovered the remarkably intact Roman bust of an athlete. Archaeologists also found the decorated foot of a bronze statue, also an important piece but obviously not complete. “It is an exceptional discovery, the most important in the last 50 years in Albania because the bust is still intact,” French professor Jean-Luc Lamboley, who led the dig at Apollonia with Albanian archaeologists, told AFP. The quality of carving, especially of the face and curly hair, marks it as Roman. It may have been buried intentionally to keep it safe during periods of upheaval. The bust has been moved temporarily to the archaeological museum in Tirana since the local museum was plundered after the fall of communism in 1990 and is still closed. Apollonia was founded in the 6th century B.C. by Greek immigrants in an area populated by Illyrian tribes. It became an important city in the ancient world because of its agricultural exports and a large harbour which was reputed to be able to accomodate 100 ships at a time. Strabo mentions it in his Geographia as a well-governed city (it was an oligarchy, with a Greek ruling class and a majority Illyrian serf population) which also has a rock that shoots out fire because rivers of water and asphalt run underneath it. It was also an early notch in Rome’s bedpost, a loyal territory under Roman Republican control since 229 B.C. Famous for its philosophical school, Apollonia was hosting the future emperor Augustus when he heard the news of Caesar’s assassination in 44 B.C. The city began to decline in the 3rd century A.D. after an earthquake silted up the famed harbour and turned the town into a malarial swamp. By the 6th century the city was deserted and fell into obscurity until grand tourists rediscovered it in the 18th century. It was never built over and so far only an estimated 10% of the classical site has been excavated, so there are many more treasures to be found.